THE BRAIN AND SPINAL CORD ARE PART OF THE CENTRAL NERVOUS SYSTEM (CNS). It’s important to understand that brain and spine tumors are not “brain cancer”. A key difference between CNS tumors and other cancers is that brain and spine tumors rarely spread (metastasize) to other parts of the body. Consequently, CNS tumors are not “staged” like other cancers. Brain tumors are typically given a grade based on how aggressive they appear under the microscope. CNS tumors are typically treated with surgery and/or radiation. Chemotherapy has traditionally not been effective in treating these types of tumors because of the blood brain barrier. This barrier protects the brain and spinal cord from toxins; however it also keeps out chemotherapy drugs that can be therapeutic. Several new chemotherapy agents have shown promise in penetrating the blood brain barrier and studies are currently in place to assess the benefit and safety of these drugs. When brain tumors grow they push healthy brain against the bones of the skull which causes swelling and symptoms. The neurologic symptoms depend on the location of the tumor in the brain and can range from headaches to seizures to loss of vision and balance. PATIENTS TYPICALLY UNDERGO A MRI TO ALLOW THE DOCTOR TO ASSESS THE LOCATION AND SIZE OF THE BRAIN OR SPINE TUMOR. Approximately half of brain tumors seen on MRI come from another cancer somewhere else in the body. 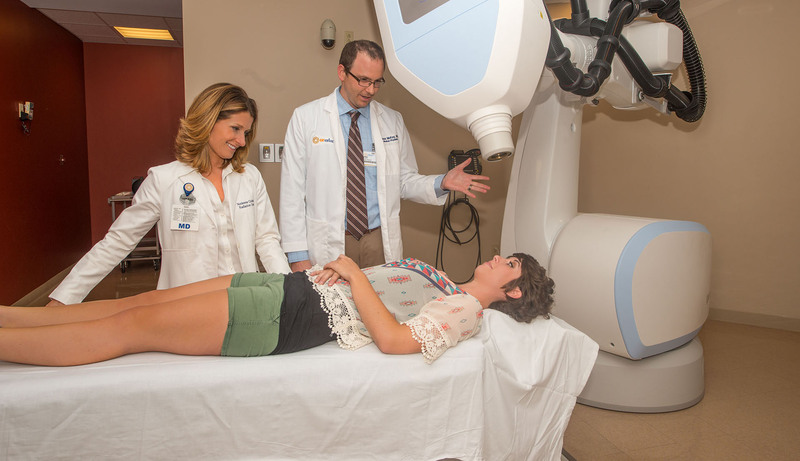 Patients will often undergo CT scans of the chest, abdomen and pelvis to search for a “primary” cancer. If a tumor is seen in the lung or lymph nodes, a biopsy of these areas may be attempted to obtain tissue for a diagnosis. This will ideally prevent the patient from having to undergo unnecessary brain surgery and the recovery time is shorter. If another tumor is not seen in the body, then the tumor is assumed to be a primary brain tumor (meaning it started in the brain and contains brain cells). A neurosurgeon is called to evaluate the tumor and assess if it can be safely resected. Depending on the location of the tumor in the brain, sometimes only a small part of the tumor can be removed (biopsy) or enough to relieve the swelling (debulking). The neurosurgeon’s goal is to remove all of the tumor she can visually see (gross total resection) however sometimes the risk of permanent brain damage is so high that it is safer to only remove part of the tumor (maximal safe resection). AFTER BRAIN SURGERY YOU WILL HAVE AN OUTPATIENT APPOINTMENT WITH A RADIATION ONCOLOGIST TO DISCUSS YOUR RADIATION TREATMENT. 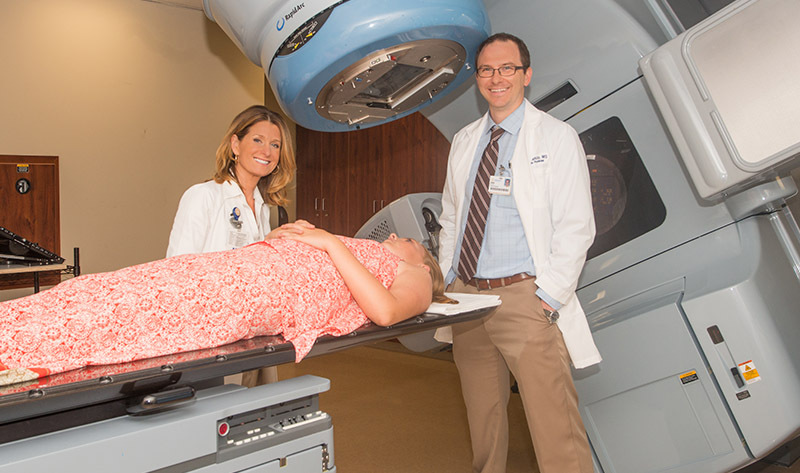 Dr. Gullett typically sees her patients 3-4 weeks after surgery to start the radiation planning. This allows time for you to be seen post operatively by your neurosurgeon, have the staples removed from your incision, and undergo clearance to start the next phase of your treatment. CT simulation is typically scheduled at this time as well with plans to start radiation a week or two later. 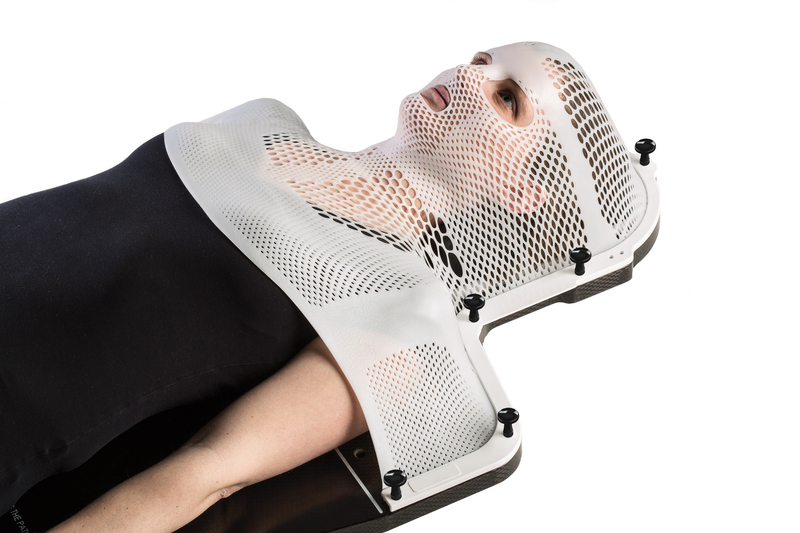 A mask will be created to ensure your head is immobilized during radiation. This allows Dr. Gullett to precisely target any residual brain tumor or the surgical cavity where the tumor was removed. Eradication of remaining brain tumor cells requires a high dose of radiation. The dose is consequently delivered over the course of 5.5 -6 weeks with the patient receiving a fraction of the dose each day. Depending on the type of brain tumor and the grade you will receive 25 -30 daily treatments or “fractions” of radiation. During treatment, the patient is placed on the treatment table in the mask and a CT scan of their head is completed so that Dr. Gullett can verify that the radiation is being targeted to the correct location. If the imaging is off by even a few millimeters, you may be repositioned by the radiation therapist and the imaging repeated. Once the images are approved, the machine, called a linear accelerator, will rotate around your head and deliver the radiation. The treatment is painless and lasts approximately 10-15 minutes. You will not see or feel any radiation being delivered. Dr. Gullett will meet with you weekly to assess your progress and discuss any side effects that may occur. The most common side effect to brain radiation is fatigue which will improve once the radiation course is completed. Patients may also experience swelling of the brain as the tumor cells begin to die off, the swelling can cause headaches, nausea/vomiting, changes in vision or difficulty maintaining your balance. If these side effects occur, you may be placed on a steroid to reduce the swelling during your treatment.